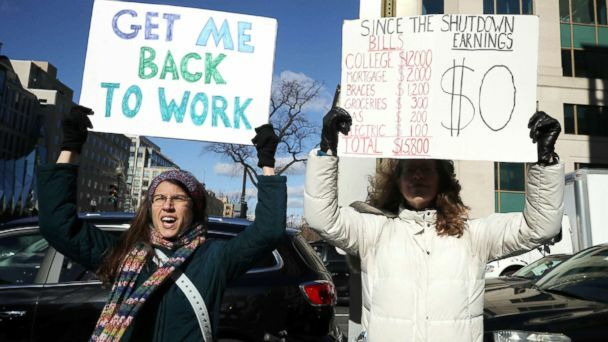 Meanwhile, nearly 800,000 federal workers are affected -- many of them missed their first paychecks since the shutdown started on Friday, according to the American Federation of Government Employees. Another one-third will experience a missed paycheck on Monday, with the rest turning up empty on Tuesday. About half of those workers -- 420,000 -- are required to work without pay. Negotiations came to a standstill this week after a tense meeting between Trump and Democratic leaders. After refusing the president's proposal to fund a wall at the southern border, Democrats claimed the president threw a "temper tantrum" walking out of the meeting. "It's cold out here and the temperature wasn't much warmer inside the Situation Room," House Speaker Nancy Pelosi said. The vice president denied those claims insisting the president was calm. "The president walked into the room and passed out candy," Pence said. "It's true. I don't recall him ever raising his voice or slamming his hand," Pence said. Trump took to Twitter to call the meeting "a total waste of time." On Thursday, the president signaled that he may declare a national emergency at the border if his administration and Democrats remain without a deal. The White House has directed the Army Corps of Engineers to explore funds in its budget to build the wall. He also canceled his trip to the World Economic Forum in Switzerland citing "Democrats intransigence on border security."